We have been honored to partner up with International Fund for Animal Welfare (IFAW) in the relief efforts for animals in affected areas after the 2015 Myanmar flooding. We feel privileged to work closely with and learn from such a large international organization which makes a difference for animals in distressed situations worldwide. Even more, we have been trusted to arrange the first officially issued invitation of collaboration between any international animal welfare organization and the Burmese government under new rule, after president Thein Sein publicly called for international assistance in disaster response earlier this month. This means we have worked directly with the Myanmar Ministry of Livestock, Fisheries and Rural Development, more closely with The Livestock Breeding, and Veterinary Department (LBVD) in the Irrawaddy division. The invitation was sent on behalf of Myanmar Veterinary association (MVA) which has been the IFAW/GAF main partner locally and thoughtfully assisted us with both planning and skilled veterinarians in the field. We know the high expertise of MVA from working with their veterinarians before, and was honored to have both their Vise President, Secretary and board members amongst our team on-site. As a unified alliance we have focused on assisting livestock in rural areas specified to upper Ayarwaddy region. These animals are a crucial source of livelihood for many poor farmers, and as the water rose high, tens of thousands affected animals stood 6 ft in water with no possibility to lay down or rest. Our main goal has been to address certain areas in Hinthada and Ingapu and work together with local authorities, bring feed to areas with no road access as well as medical care and assistance from experienced veterinarians. We are thankful for this fruitful collaboration with all partners involved. Last, let us not forget that the aftermath of this national disaster is not over; although the water level has gone down many thousand animals now suffer from diseases, injuries & wounds from standing up to 10 days in water, and malnourished as the surrounding grass has gone moldy and toxic. We hope the international community will not forget about the still desperate situation for many domestic animals and their owners, also after the first media interest fades away. Situation Report from disaster response to Myanmar flooding 2015, Ingapu township in Hinthada district- Ayeyarwaddy division. After saving human lives and securing their safety in the flooding disaster, the next priority is their long-term survival and livelihood. In rural Myanmar livestock play an irreplaceable role for farmers as their ploughing animals in rice fields and for transport. Thus it is essential to remember the value of rescuing these animals. During assessment and relief response in Ingapu, Hinthada district in Ayeyarwaddy division IFAW/GAF had the pleasure to work with a team of truly dedicated people. 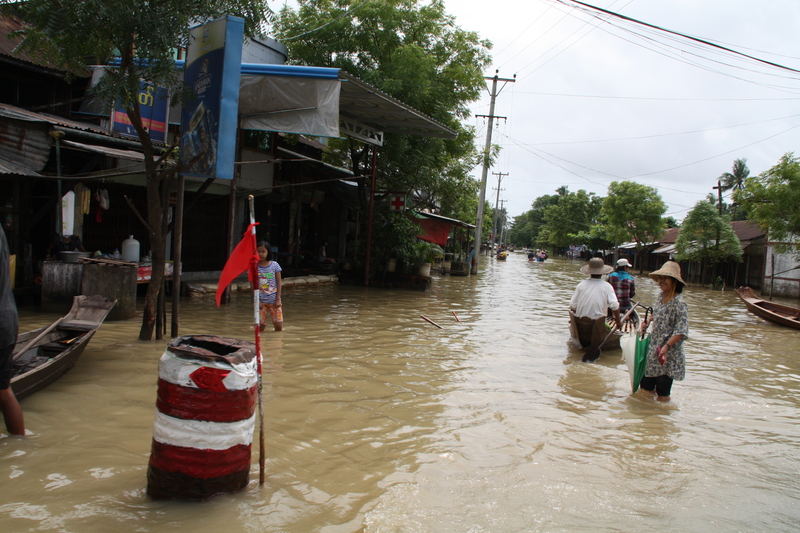 The LBVD District Officer of Hinthada Dr. Aye Kyi, Township Officer of Ingapu Dr. San Win, and Deputy Township Officer Dr. Hliang Po Moint all work around the clock to assist in flood affected areas. The district has an impressive group of extension workers- volunteers who act as veterinarian helpers with two weeks of training in first aid. We also had a meeting with the township disaster management committee; U Hlwam Moe Han and his assistant U Tin Tun Aung. When we arrived, some cattle had been standing in the floodwater for ten to fifteen days with no possibility to lie down because of the high level. The result was distressed animals with open wounds on their legs and joint problems. Others had been temporarily moved to higher ground along the roads but with no access to local grass. Many villages had not relocated because they were used to the seasonal rain and did not understand how serious the situation was before it was too late. Even though some people could stay dry in their stilt houses, their larger farm animals- mostly cattle and buffaloes- could not be moved inside and therefore had to stand in water until help was on its way or the water level went down naturally. 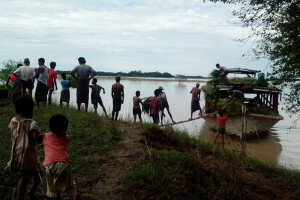 Over flooding from a local dam also caused problems as some villages along the river were caught in-between the dam’s floodwater and the much higher than usual river level. Shortage of boats to transport cattle feed was also an issue. IFAW/GAF was able to do an assessment and help with medicine and feed in two local villages in Ingapu; in Kambed where 659 cattle were affected, and Thet Ke Pyin Than where 247 were affected. None of the villages were accessible by road, only by boat taking 30-45 minutes. To understand the urgency of the situation better there is calculated that 1 bundle of grass feeds one cow a day. 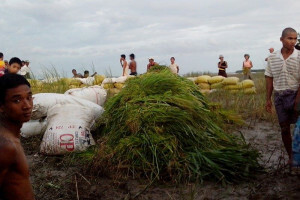 One boat can take 60 bundles of grass and 25 kg cattle feed. In the Ingapu region there is currently 4000 cattle in need of this feed (8000 at the highest peak), and only a handful of boats are available to transport goods to both humans and their animals. In Kambed, when the water level was at the highest (about 2 meters), the whole village with 70 people gathered inside the monastery with all animals except their cows for 15 days. The cows stood deep in water for the whole period of time resulting in at least 60 animals with injuries. This example is just one out of 652 villages in Ingapu. In Thet Ke Pyin Than village the situation was somehow better. They had taken the flood-warnings seriously and built docks of logs, clay and water grass to keep their livestock on level above water. Out of their 247 cattle none had injuries, but they were stressed after going long time without food. Some had relocated their animals, but it was a 32 kilometre walk taking the whole day, and they were afraid their temporarily sheltered cattle were not safe from theft. The following days cows were inspected by veterinarians one by one for a health checks, given medicines and had their wounds cleaned. The veterinarians from MVA whom accompanied us also explained in detail how to distribute craft feed to give to malnourished animals. We are thankful for the collaboration with professional veterinarians from Myanmar Veterinary Association whom accompanied us on to Ayeyarwaddy, and LBVD who do a great job to provide help and assistance on local level. It is also important to notice that after the water level once again went up there is still 4000 cattle in need for feed in Ingapu for the next 3 months (until nov. 2015) until the local grass has regrown.